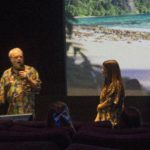 Disney Examiner was invited to attend the “Moana” Blu-ray and DVD event held at Disney Animation Studios in Burbank California, where we got to participate in a Q&A with Co-Director Ron Clements and Producer Osnat Shurer, as well as watch some of the bonus features before the Blu-ray is released. At the event, the filmmakers showed us many of the special features that you can see on the Blu-ray edition. In “Things You Didn’t Know About…Meet the stars of Moana” a dynamic Q&A featuring Dwayne Johnson, newcomer Auli’i Cravalho, famed animation Directors Ron & John introduces you to the minds behind the movie. 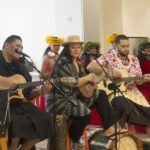 Features like “Voice of the Islands” and “The Know the Way: Making the Music of Moana” reveals the cultural history of the movie. And fun shorts like “Maui Mini-Movie: Gone Fishing” gives us even more time with some of our favorite characters. Both the Q&A featurettes and the mini movie are really fun and entertaining additions to the Blu-ray, but where the true worth of this Blu-ray lies is in its behind the scenes documentaries, especially the 31 minute documentary “Voice of the Islands”. It has been very clear from the beginning that the filmmakers wanted to represent the culture of the Pacific Islands very well. In this documentary the filmmakers talk about their trips to the islands and how working with their story team and meeting all of the people who live in these places had a strong influence on the story of Moana. The filmmakers of course took this to heart and set out to make a film the people of the Pacific Islands would be proud of. Interestingly enough, a lot of what they learned about the culture actually influenced huge story elements and even individual shots in the film. For example, when describing the ocean to the filmmakers, the Pacific Islanders would personify the ocean as if it were a person, so they decided to actually make the ocean a character in the film. Overall this Blu-ray looks like it’s going to be one of Disney’s best home releases in recent years. “Moana” is a great movie filled with some of the most beautiful animation Disney has ever done. The disc itself is also packed with a huge amount of extra content, including the eye opening documentary “Voice of the Islands,”and commentary from the co-directors John Musker and Ron Clements. You can see one of the features in the video above, and buy “Moana” digitally on Tuesday, February 21st and on Blu-ray Tuesday, March 7th. My camera keeps taking these nice photos by itself and I don't know how to stop it.